There’s a game that you sometimes find at amusement arcades called whack-a-mole. Toy moles rise out of their holes at random and the player uses a large mallet to whack the moles on the head and force them back into their holes. A successful player needs vigilance, composure and a quick eye. For human rights defenders, the protection of civil society space is a lot like a game of whack-a-mole. Threats arise without warning and valuable time, resources and energy are spent opposing them. Almost one year ago, the Human Rights Council passed a resolution urging States to ‘create and maintain, in law and in practice, a safe and enabling environment in which civil society can operate free from hindrance and insecurity’. In too many cases the Human Rights Council’s resolution has not translated into domestic action and last week in Geneva ISHR convened a group of expert whackers from around the world to share their experiences of threats to civil society space and strategies to counter those threats. Participants discussed anti-protest laws, restrictions on the establishment and funding of civil society organisations, constraints on the work of journalists, and national security and counter-terrorism laws that unduly restrict freedom of association and assembly. Each of these restrictive practices constitutes a current threat to civil society space in my country, Australia, and it was both troubling to see the regularity with which these laws and policies arise around the world, and encouraging to be exposed to the skill and dedication of human rights defenders working to defeat them. We discussed and debated strategies for protecting civil society space, including building and maintaining strong coalitions, engaging with UN human rights mechanisms and other international actors, working with Governments and legislatures, strategic litigation, monitoring and reporting and working with the media and social media. We shared stories of success as well as failure. What was abundantly clear during the ISHR convening was that human rights defenders should not be spending their time whacking moles. Beyond our work protecting civil society space, we are engaged in issues like persecution on the basis of sexual orientation and gender identity, militarisation, sustainable development, climate change and refugee rights, to name a few. In addition to enabling civil society through the proper protection of freedom of expression, assembly and association, States should make public commitments to support civil society and protect civil society space. Those commitments should be backed up by legal and institutional protection against intimidation and reprisals, support for the establishment and operation of non-government organisations and mechanisms to ensure transparency and accountability. Human rights defenders will return home from ISHR’s consultation, training and advocacy program with their mallets at the ready, but really it would better if we didn’t have to use them at all. You can follow Rachel on Twitter at @RachelHRLC. 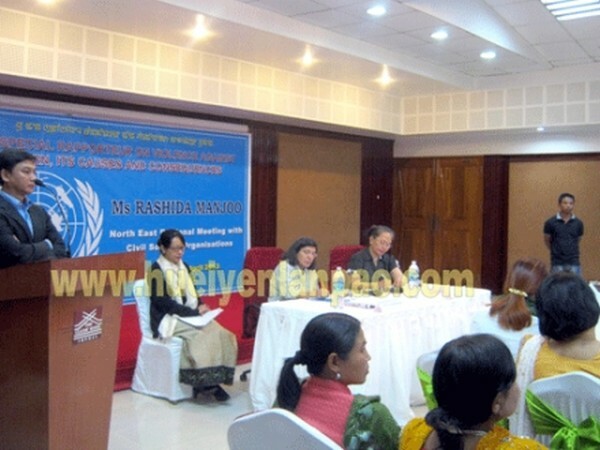 The Indian agency E-Paonet reports in some detail on the visit by a UN Special Rapporteur to India. Let’s start by acknowledging India’s willingness to accept the Rapporteur (unlike other countries such as Eritrea I just reported on today)!